Ohio's pennant-shaped flag is modeled after a Civil War cavalry guidon (identification banner). 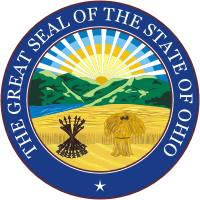 The 17 stars in the blue field represent Ohio becoming the 17th state, and the 13 stars surrounded the state's initial (in white), are symbolic of the original 13 colonies. The red, white and blue are taken from the flag of the United States of America, the Stars and Stripes. LARGER FLAG: View this flag at 800 pixels wide here! all USA State Flags here!